The cherry trees around the Tidal Basin have emerged mostly unscathed from the strong winds we've had the past day or so as we caught the outer edge of the vicious nor'easter that has been slamming the northeast. There are other types of trees nearby that have taken a beating, as you can see in some of the photos below. But even some of the oldest of the cherry trees that have big, heavy branches arching out at strange angles have come through just fine. It's still breezy out, but nothing like it was yesterday. The highest wind gust measured at National Airport, just across the river from the Tidal Basin, was 62 MPH with an average windspeed of 30 MPH out of the northwest. I didn't walk the entire perimeter of the Tidal Basin this morning, but I came across relatively little damage to the cherry trees. The buds themselves are just fine. They're still bundled up tight and well protected. So the wind won't have any effect on the progress toward the bloom. 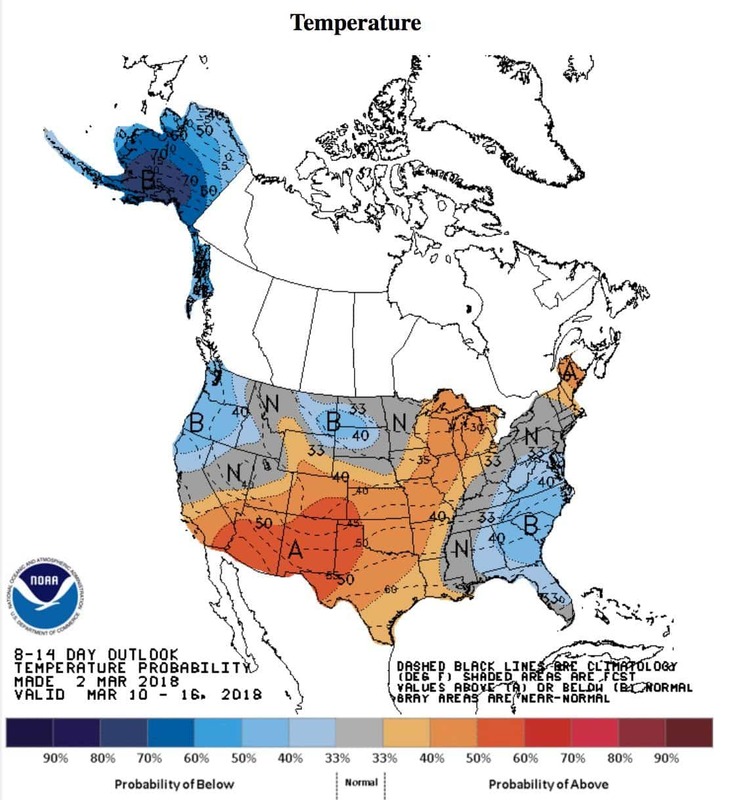 The latest 8-14 day forecast from the National Weather Service suggests that we've going to have cooler temperatures for a bit and then around the middle of the month things will warm up. And it's those warmer temperatures that are going to speed things up. This map shows the current assessment of the probabilities that temperatures will be cooler or warmer than average for the period March 10 to 16. As that orange section moves from left to right and gets across to us it will give the cherry blossoms a spurt of energy. West Potomac Park near the John Ericsson Memorial.